Dec. 1 is World AIDS Day. Emory has several related events planned to build awareness for HIV and AIDS. Update: Today's display of the AIDS Memorial Quilt has been moved from the Emory Quad to inside the Dobbs University Center in case of rain. World AIDS Day is held each year on Dec. 1 to remind everyone — but especially those lucky enough not to have had their lives directly affected by the AIDS epidemic — that the worldwide struggle against the disease remains urgent. 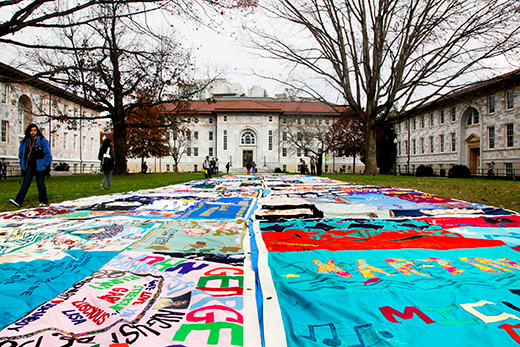 For the past decade, Emory's annual Quilt on the Quad, the largest collegiate display of AIDS Memorial Quilt panels in the U.S., has served as a massive reminder to anyone walking through campus. But this year, the quilt will be joined by other sights and sounds intended to draw increased attention to HIV prevention and education. On Dec. 1 between 10 a.m. and 4 p.m., Emory's student-organized Quilt on the Quad returns for an 11th year with its largest display ever — about 900 quilt panels. The AIDS Memorial Quilt was founded in 1987 and now contains more than 48,000 individual panels, each measuring 3 feet by 6 feet and honoring a person who died as a result of AIDS. New for this year: A parade, leaving at 10 a.m. from the Science Commons and ending at the Quad, will be led by the Mausiki Scales Common Ground Collective Band, an Afrobeat band that explores musical styles from West Africa. Dancing alongside the band will feature faculty from the Moving in the Spirit program, an Atlanta-based youth development program centered on dance. The dance troop has developed a piece that will address the AIDS epidemic in metro Atlanta, says Jessica Moore, a senior majoring in neuroscience/behavioral biology and co-president of the Quilt on the Quad event. Atlanta is ranked No. 5 among U.S. cities in its rate of new diagnoses of HIV. And according to rates at Grady Memorial Hospital's HIV testing program, almost one-third of patients now diagnosed in Atlanta with HIV have advanced to clinical AIDS. Other campus events for World AIDS Day include a mobile testing facility offering free, onsite and confidential HIV tests to the public, an ethics panel, healthy love workshop and evening rally. "It gives people more opportunities to be involved. Partnering in all these different ways allows us to have events all over campus on World AIDS Day," Moore says. "Students are here, there and everywhere so they'll see more and be able to get more involved." The U.S. Centers for Disease Control and Prevention estimates that 1.2 million people in the U.S. are living with HIV, with roughly 50,000 new infections per year. Of those who are HIV positive, almost 1 in 8 or 12.8 percent do not know their status. According to the World Health Organization, approximately 35 million people worldwide are living with HIV/AIDS; sub-Saharan Africa is the most affected region, with 24.7 million living with HIV.